We have today a new blog launch. For those willing to see the blog live, go to Beat Depression Forever For a list of features, read ahead. This one was a fun project, despite of the chosen niche. As with a lot of heaqlth and mental health realted niches(see anxiety…), it is hard to find a sweet spot for a new blog. We did our job however and gathered a host of nice keywords. Most of them are not in the easy-to-domincate catergory, but they are rewarding in the visitors field. This is the first theme we used that uses theintegrated custom fields available from Wp 2.9 update. It’s a very nice feature, that makes posting the thumbnail and the gallery image a breeze. 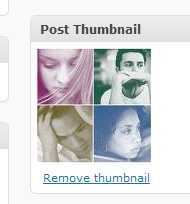 Just select post thumbnail from the Wp menu, go to your media library and select the image and that’s it. In the image to the left you have the result, the image that will be used it’s displayed for confirmation and can be removed with one mouse click. In this casee, the same image is used for the image gallery on the front page. Neat and easy. Monetization – As with all our clients, we advised to NOT turn on all the money-making options for the first weeks. For SEO, indexing and natural grow standpoints, it is advisable to add this features gradually. However, everything is set and prepped for the right moment. Right now you can see on the site the sidebar widgets with Clickbank ads and Skadoogle ads, featuring affiliate programs from Clickbank, Paydotcom and directly Paypal. 2 banners- the big tower on the left sidebar and the header are directly linked to another affiliate program. Using Affiliate linker, as in most of aour neewly released custom blogs, any keywords can be converted into affilaite links – check for “beat depression” keywords to see them in action. There are still other options to be added later on but even so this is a well prepared for earning blog. As with all our clients, it will have the option to join our upcoming CPA network and add even more potential earnings. And to prove that we did our job well, at the time of this writing, the blog is on #11 for the “beat depression” keyword phrase. This is before even publishing all new articles, so we are confident it will go up in ranks in short time.